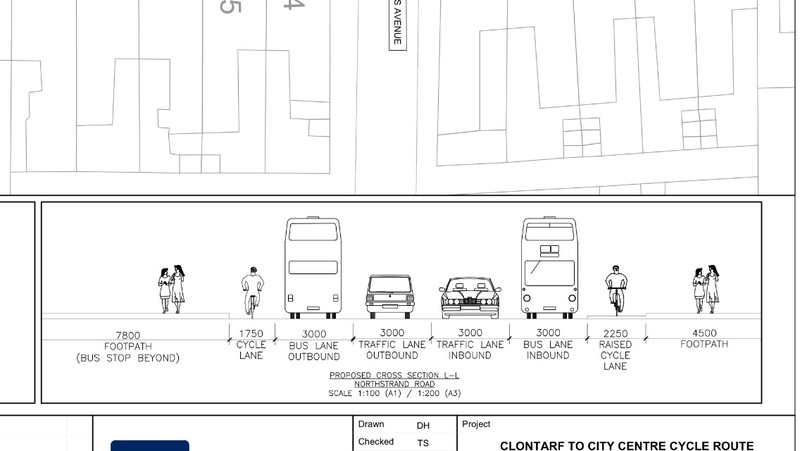 Dublin City Council is currently consulting on Part 8 planning for the Clontarf to City Centre Cycle Route, but, as we reported last week, the current plan mixes bicycles with heavy traffic as well as mixing walking and cycling in shared areas. Below is part of our in-depth look at the route. 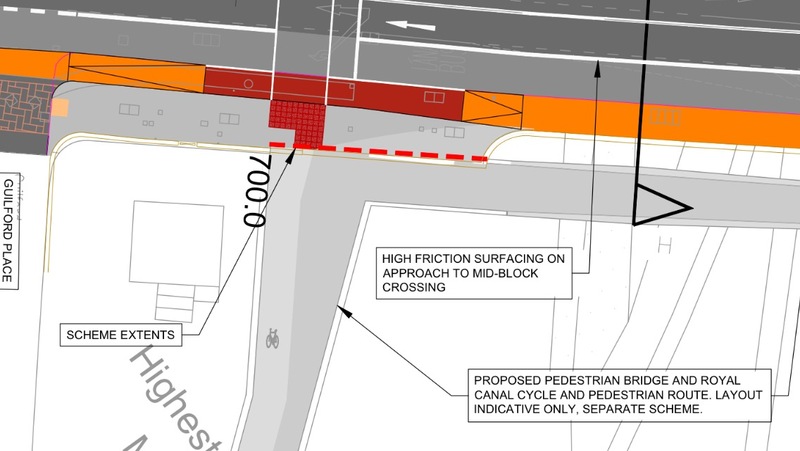 We are asking readers to sign the petition to look for a fully segregated route, which is safe and attractive to people of all ages and abilities. 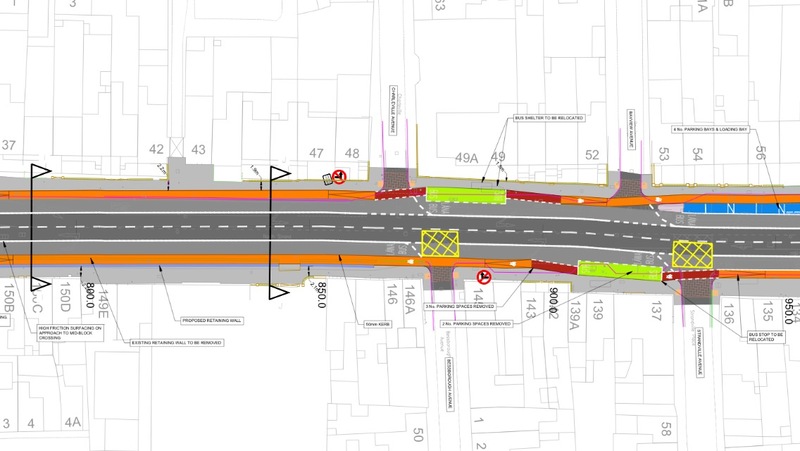 We’ve already looked at the route between Amiens Street at Connolly Station to the Five Lamps, and in this article we will now look at Five Lamps to the junction before Fairview. 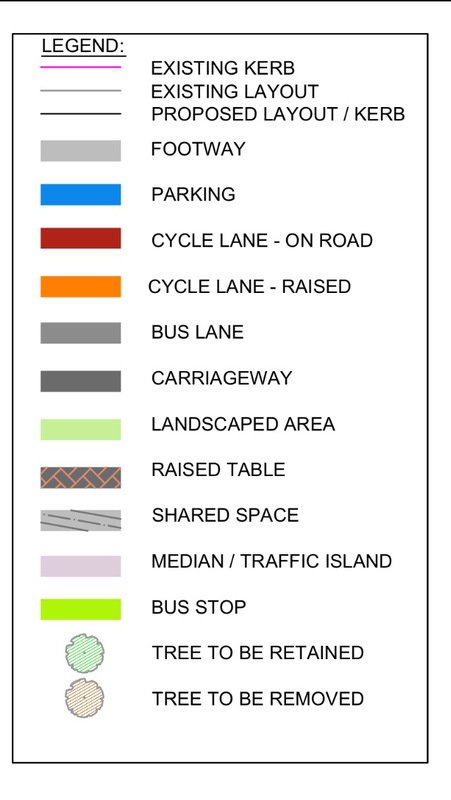 The map key is shown above — note cycle lanes in red and “cycle lanes – raised” (ie light segregation) in orange. 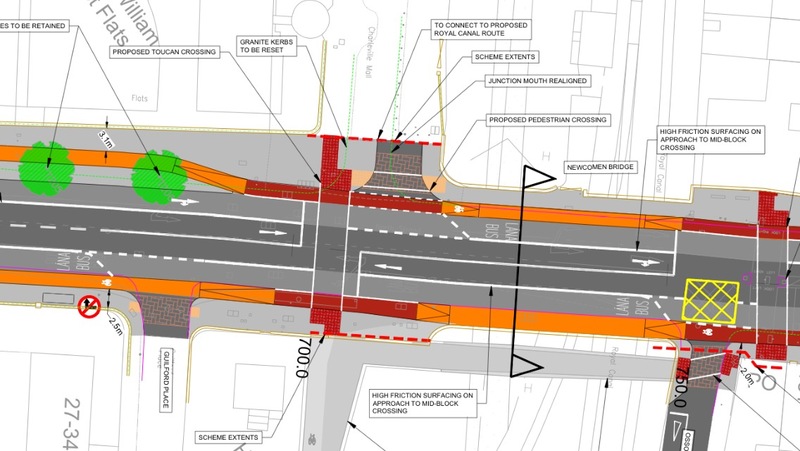 The Five Lamps junction leaves people cycling in all directions exposed and unprotected. 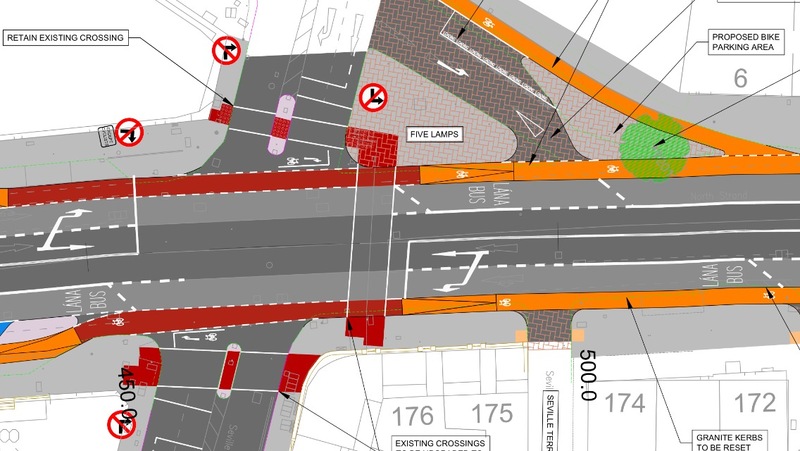 The junction also goes against guidance in the Manual for Urban Roads and Streets which states that designers should put crossings at all arms of junctions. It means people have to cross three times to get just from one side of the road to the other. 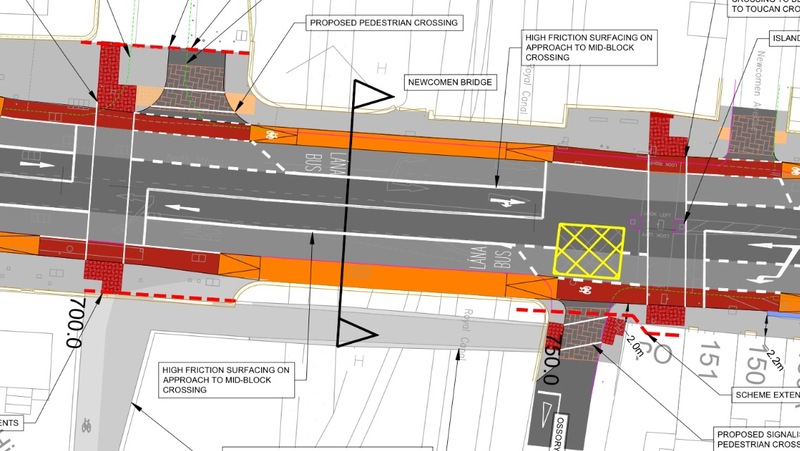 This to bad design for the inner city communities who are split by roads, it’s bad design for public transport users and it’s bad design for visitors to the city. 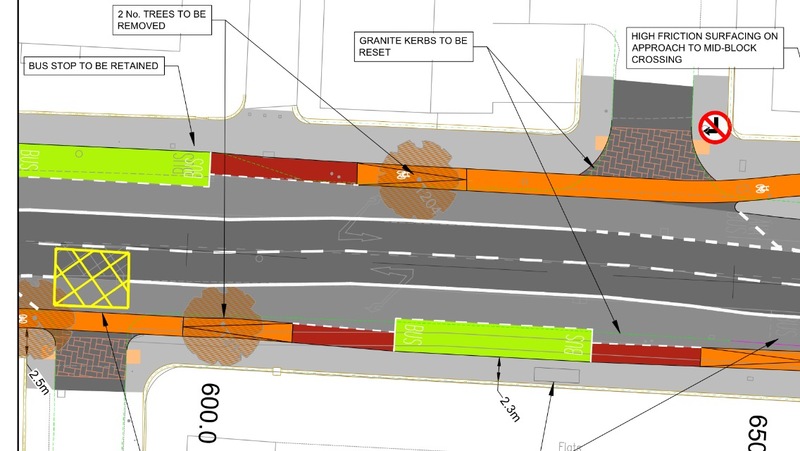 Combining the space from the cycle lanes (red) and the lightly segregated cycle track (orange, segregated with very low kerb) would make a two-way cycle path on one side of the street. 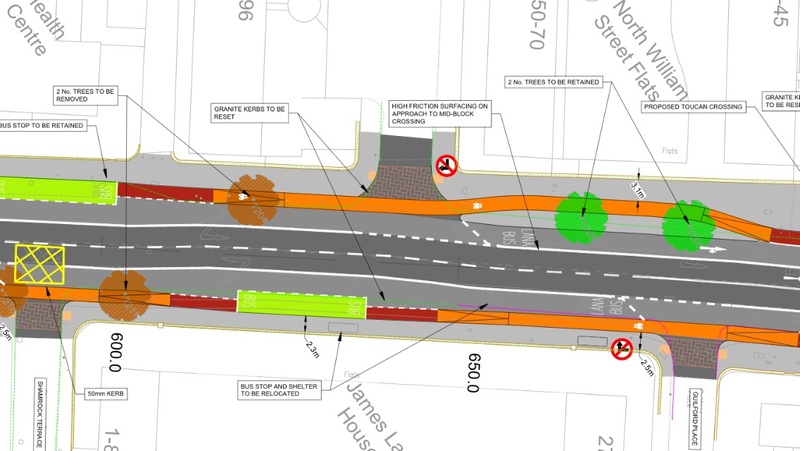 Moving around the footpath buildout and traffic island spaces and you have a buffered two-way cycle path with waiting spaces for turnings. 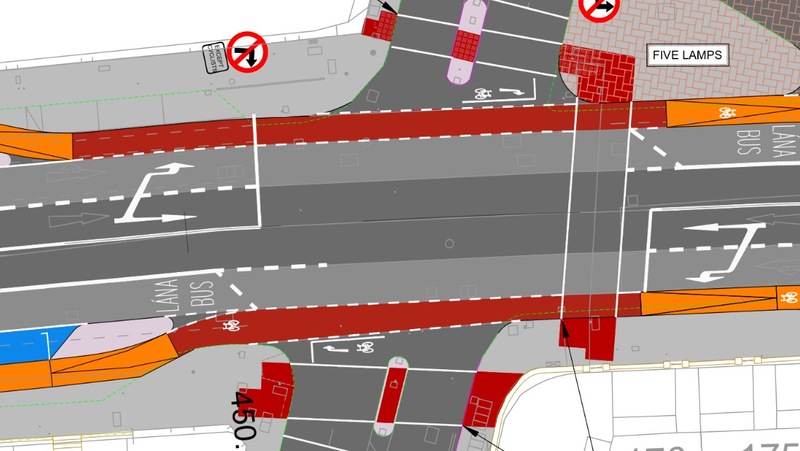 To put it simply: you then have a Dutch-like junction, simular those on some recently built cycle paths in London. 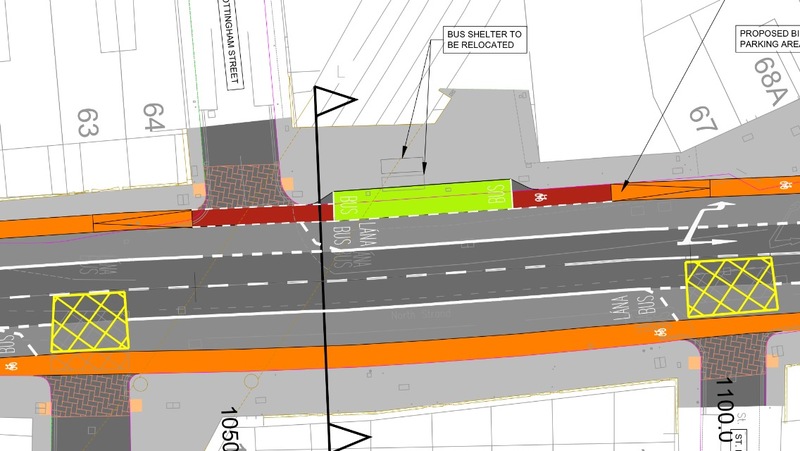 Just north of Five Lamps is the section shown in the two drawings above, a 1.75 metre raised cycle track is not suitable for even the current volumes of people cycling on this route — it will less suitable for an even slightly improved route. 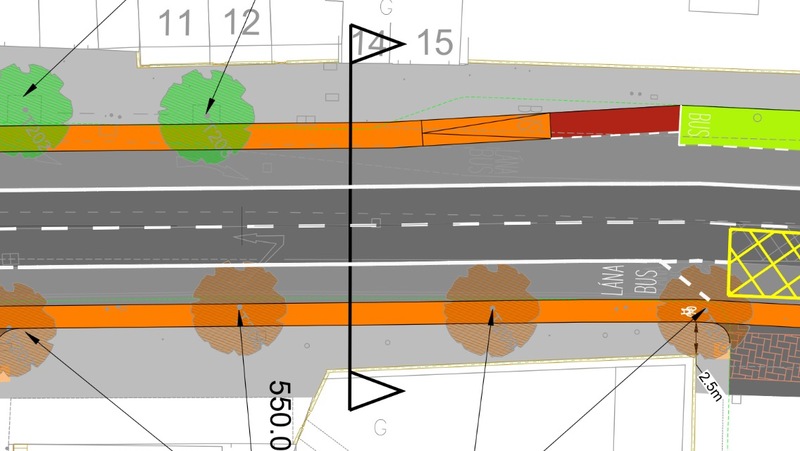 Having a two-way cycle path on one side of the street solves a lot of the width issue by combining the cycling space, which allows for side-by-side cycling space and overtaking. As with the part 1, bus stops (shown in green) again interrupt the cycling segregation. This is the opposite of segregation for good reasoning — Dutch cities started using segregation at bus stops before the rest of the street before and after bus stops. From a safety and attractiveness point-of-view, the Irish approach makes little sense. The design means existing buses would effectively get out of the way of BRT buses planned for this route — it’s all about BRT buses getting a higher priority than existing buses rather than giving high priority to all buses. Even bus advocates aren’t too impressed with the approach. This image shows the bus stops shown in the last image and it shows a BRT stop — where there are two green circles depicting two trees. We only know that it’s a future BRT stop because we’ve seen pre-Part 8 drawings. 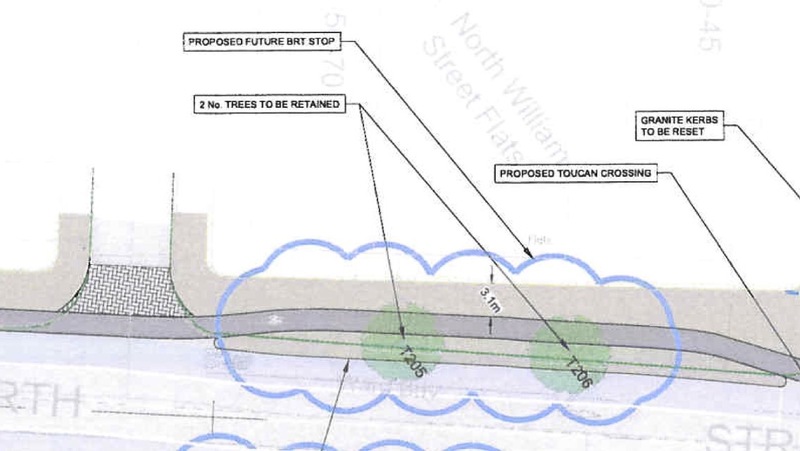 This is the spot with the trees in pre-Part 8 drawings — the text reads: “Proposed future BRT stop”. This is not mentioned in the Part 8 public constitution drawings — which is completely unfair to the public and their understanding of the project. 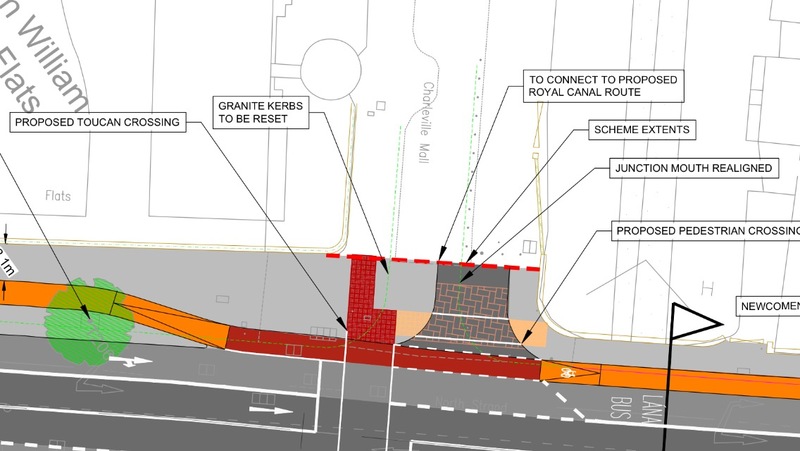 The first image is an overview of the tie in within the Royal Canal Greenway and next two images are close ups of both sides of the road. 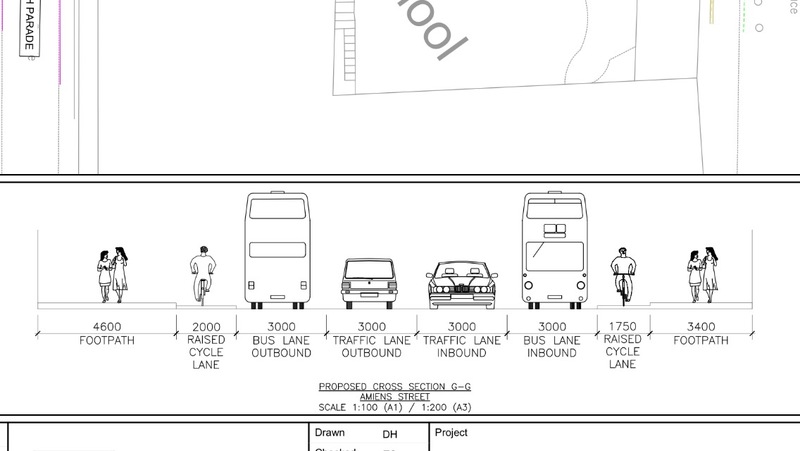 There loads of space for segregated cycle paths and segregated crossings here but the council has opted to direct an important local and coast-to-coast cycle route across footpaths and rather than make clear separate space for waking and cycling. Why are Irish councils obsessed with mixing walking and cycling? There’s loads of space here. Here a new bridge is under construction to provide space for cycling on the current bridge. This is the only real pinch point on the route. 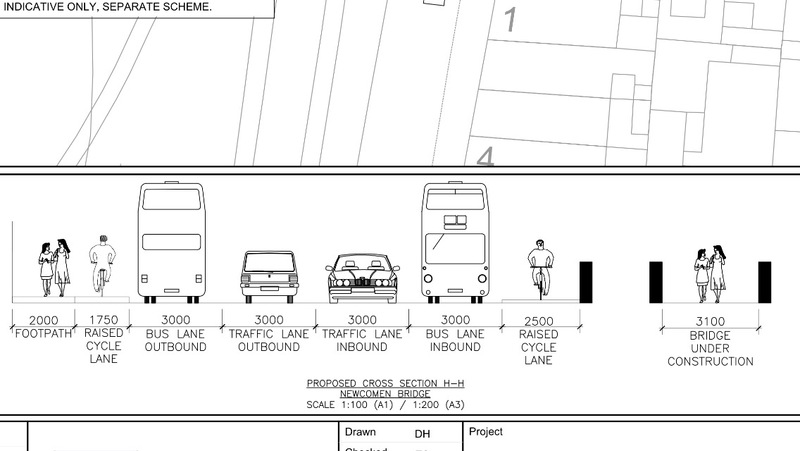 The next section includes more bus stops interrupting the cycle route and more parking without any notable buffer space. 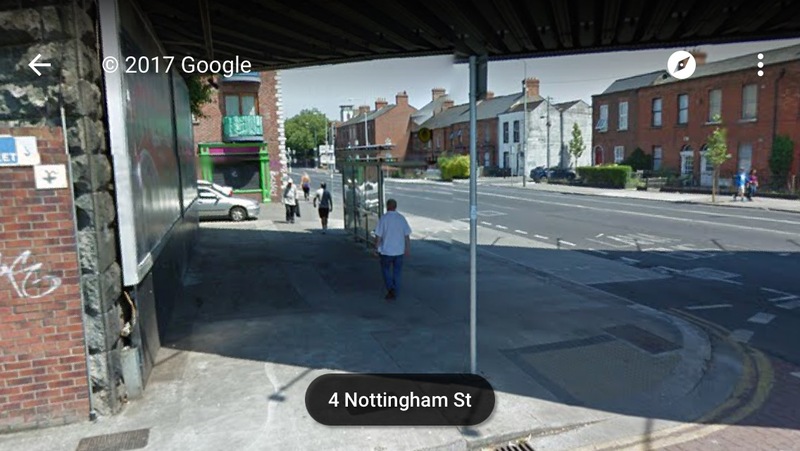 Just a small bit down the road there’s another bus stop and not even a hint at providing a bus stop bypass despite the large space around the current footpath, as shown in the Street View image above. 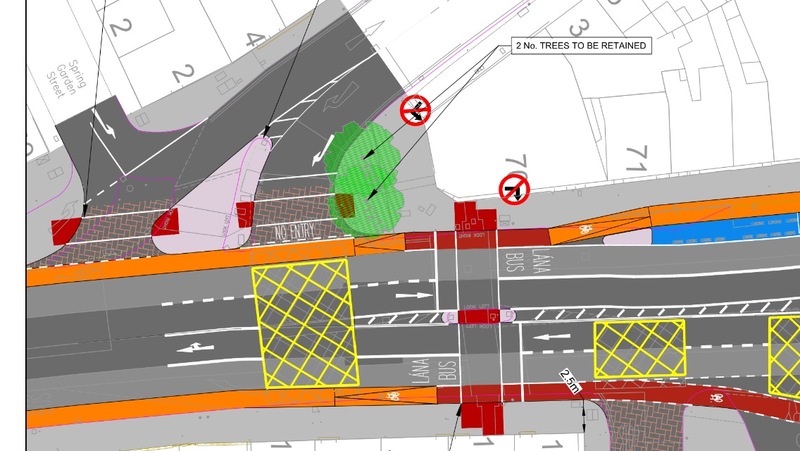 At the junction with Annesley Place there’s no sign of any kind of crossing which does not involve mounting the footpath to use the shared walking and cycling crossing. As far as segregation is concerned this section above is slightly above the average of the route, but it’s still mixed and it’s short-lived. We end this part here just before the junction of Poplar Row and East Wall Road, and the bridge over the River Tolka. It’s all so bleak. Where’s the ‘extensive landscaping’. 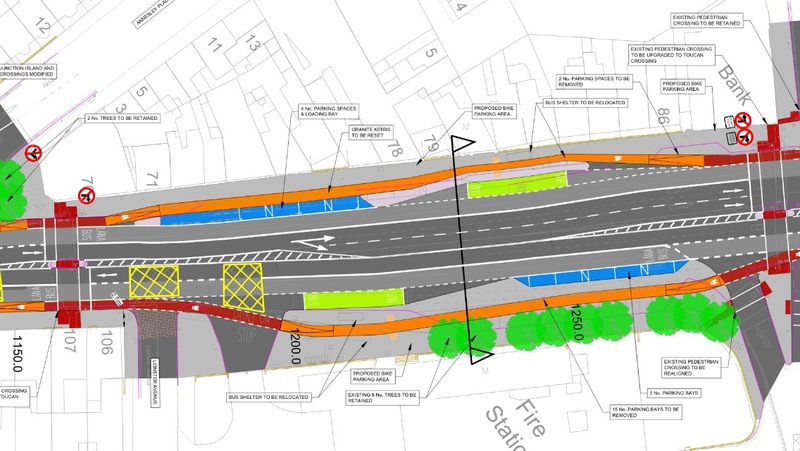 Just looks like a traffic engineers dream.